Ladies and gentleman, may I present to you Zakumi: the official mascot for the FIFA 2010 Football World Cup in South Africa. 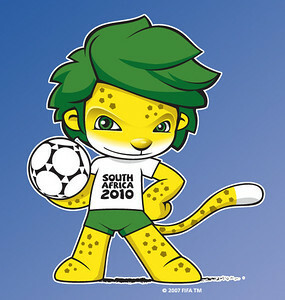 Zakumi is a Proudly South African (and African) leopard in the green and gold of Bafana Bafana with green hair. The green hair was a decision he made once as "he felt it would be the perfect camouflage against the green of the football pitch; a bit like his rosette spots are when hunting in the wilderness!". You have to read the full story on the mascot. Zakumi isn't just a mascot, he's a whole persona too. The name ‘Zakumi' is a composition of ‘ZA' standing for South Africa and ‘kumi', which translates translates into ‘10' in various languages across Africa. A lot of thought has gone into Zakumi and I quite like him.